What can you do to ensure that your child’s attendance is the best it can be? Ensure your child is on the school site at 8:30am. Send your child to school even if they’re feeling a little under the weather. We will send them home if we need to. Book all medical appointments after 2:50pm. If the only appointment available are during the school day, please bring them to school either before the appointment or straight after. Immediately contact your child’s pastoral team if there is a reason why your child does not want to come to school. Attend any meetings/information sessions that you are invited to. Check your child’s planner weekly and familiarise yourself with their attendance. Ensure the school has up to date phone numbers and (e-mail) addresses. At Woodlands your child’s attendance at school is a priority. 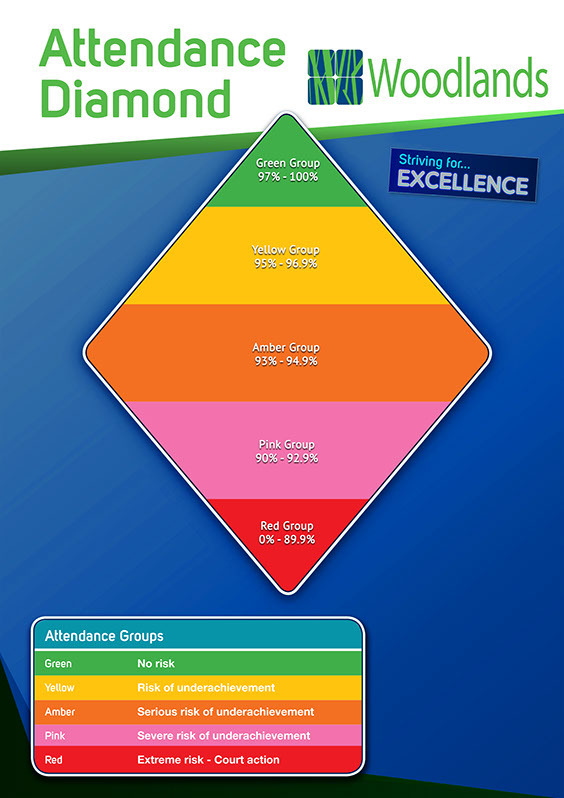 You can see from the diamond opposite – if attendance is below 97% your child is at risk of underachievement. As a parent you are legally expected to send your child to school daily. You will be committing an offence if you fail to send you child to school regularly and punctually. What does your childs attendance figure mean?